Mindanao Railway System will soon be started by the middle of President Duterte Administration’s term. But as early as this month, they have been eager to jumpstart the Railway System development that will involve the construction of circumferential railway system that will be built in six phases and at present a feasibility study on the railway system is being conducted which is expected to be finished by the end of August. 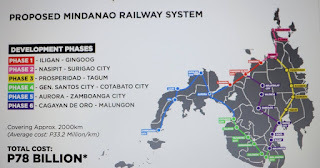 The first phase of the Mindanao Railway System would be in Region 10 Area and it will be the construction of a line from Iligan, Cagayan de Oro City and Misamis Oriental which will cover a 124.65-kilometer single and double track rail mainline from the municipality of Jasaan, Misamis Oriental to municipality of Linamon, Lanao del Norte. The first phase is intentionally for the benefit of the Cagayan-Iligan Corridor. The second phase is a system from Nasipit in Agusan del Norte to Surigao City. The third phase will run from Prosperidad in Agusan del Sur to Tagum in Davao del Norte. Next will be from General Santos City to Cotabato City, then another railway system will be built from Aurora in Zamboanga del Sur to Zamboanga City. Then there will be another line from Cagayan de Oro to Malungon in Sarangani for passengers that will cross from Northern Mindanao to Southern Mindanao area, vice versa. That means that Cagayan de Oro City and Davao City will be the main point railway station of the Mindanao Railway System. The allocated budget for the Mindanao Railway System will be about 86 Billion pesos. Last week on the Senate, Senator Sonny Angara filed a bill creating the state-owned Mindanao Railway Corporation that will have an authorized capital stock of P1 billion, with an 11-person board, all appointed by the President. MindaRail will locate its offices in Davao City. 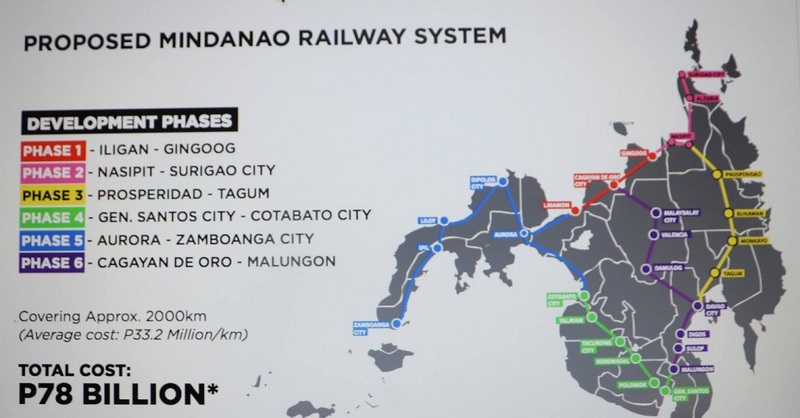 “Establishing the MindaRail would allow the island’s urban centers and growth corridors such as the cities of Davao, General Santos, Butuan, Cagayan de Oro, Cotabato, Malaybalay to be linked by rail,” Angara said. Teresita Socorro Ramos, NEDA regional director, said in an interview that the Mindanao Railway System will improve connectivity among the different regions which in turn increase the level of exchange in terms of goods, products, and people. She explained that when there is greater mobility, economic growth will follow and tourism is enhanced because people can transfer easily from one place to another. Business will also grow as the railway will have several stopovers where businesses will be established, she added. Who are private funders of the project? Government funding only? Why not Build Operate and Transfer? This Mindanao Railway Project was promised by then Senatorial Candidate Joe De Venecia in the mid-80s while campaigning at the Amphitheater in Cagayan de Oro City. He won as senator, then slid off to congressman the next election to become the House Speaker. But his promise was a hoax to propel his political ambition. And here comes Digong - a true Mindanaoan, this railway system in Mindanao will be realized..Salamat kanimo among Presidente Digong Duterte!!! Hopefully my suggestion will be notice, please correct me if I am wrong. GOD BLESS to our President Rodrigo R. Duterte. Laguindingan Airport is a common airport for the people of Bukidnon, Camiguin, Gingoog, Cagayan de oro (Misamis Oriental) and Iligan. According to many citizen, the future plan of Laguindingan Airport is, it was prepared for improvement and ready for expansion to became an International Airport of Mindanao. Better to include to have a railway station in Laguindingan Airport. Yes, your suggestions sir are already in the plan. The railway will have a station at the airports and piers because that is an SOP in every railway projects to connect major terminals. Railway station near airports/piers are ideal for compact/high-density areas where time interval in-between trains is short. Aside from ending livelihood of PUVs, taxis, shuttles when travelers will prefer rail station, scheduling is chaotic for train rides due to untimely/infrequent arrivals of planes or ship-docking. If such pipe dream is feasible, then NAIA shud hv been connected by LRT/MRT by now. Ideal location of stations should b near heavy-foot traffic centers like malls or public markets to transfer goods.